Have you heard about Simple? Simple is a really cool new bank replacement. CK and I officially switched all of our really horrible old banking accounts over to Simple completely in August (after being on the waiting list for a Beta invite since June of 2010) and haven’t regretted it for a moment. We both absolutely love it. What’s so different about Simple you may be wondering? Well for one, they’re entirely focused on customer service. Ever tried to get someone at your bank to help you? Did you feel good afterwards? I’m guessing probably not. I’ve had several of the most pleasant customer experiences of my life with these folks, both over the telephone as well as online, with representatives that were both witty and knowledgable. If I ever have a question about anything on my account I can simply start a conversation on their web interface and someone gets back to me usually within an hour. For real. What’s really cool about Simple though is their spending tracking and analytics. You can easily tag, search, and filter your purchases in a number of user friendly ways. Plus Simple actually learns your tags so you don’t have to keep tagging items each time you stumble into Whole Foods. Perhaps the scariest tag for me to review from time to time is the coffee tag. Yikes! You can check out my monthly coffee expenses in the graph below. Now the truth really comes out. But it’s OK. We should know these things! Not just think about them fearfully in the abstract. But my favorite feature of all are the goals. You see, in Simple you only have one account instead of a separate savings and checking. In order to put money aside you create what are known as goals. Goals allow you to assign your money to different “buckets.” These funds then are removed from your “Safe to Spend” balance. This means that with a quick glance you always know exactly how much money you have left in your account and how much is already earmarked for other things such as rent or savings for Christmas presents. This feature finally allows you to truly organize and actually follow that dusty budget you have saved in an Excel spreadsheet somewhere deep and dark on your harddrive. There are also goals that can be created with a specific deadline. When you create one of these types of goals Simple automatically calculates how much money needs to be withdrawn from your Safe to Spend bucket daily and places it into your long term savings goal. One of the items I have scheduled is allocated to the future iPhone that I assume will be released next September. So every day Simple adds a little more to that fund and whenever that magical Apple event does take place I’ll already have my money saved and ready to blow. CK and I also both have a bit of a silly goal that we’re splitting the difference on. 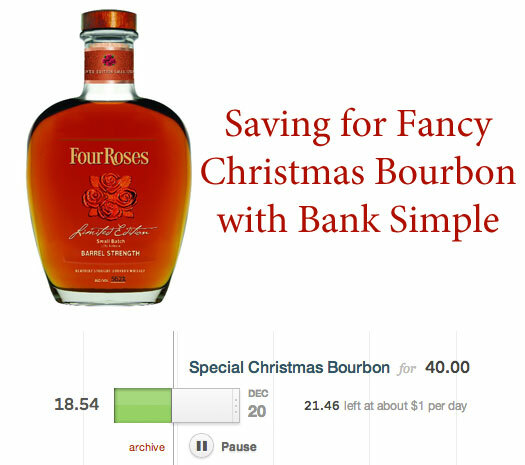 A few weeks ago we saw this $80 bottle of Four Roses Limited Edition Small Batch Bourbon at the liquor store and given our affinity for Manhattans we thought this would be a killer ingredient to try. Instead of impulse shopping the bottle on the spot though we decided to both create a goal in our respective accounts splitting the difference and will have just the right amount a few days before Christmas. Santa is going to be a very happy camper on Christmas Eve! Simple is still invite only but I have five invitations if anyone would like one. First come, first serve. You can leave me a comment below, email me, or send a message on twitter. Whatever works for you. Sorry folks that’s all the invites I have but you can join their waiting list by going to simple.com. Would love an invite! Mint.com is wicked buggy … Thanks Erin! You got it 🙂 You’re going to LOVE it. I really tried to like Mint but it was so cumbersome. Simple is amazing. And so pretty to look at. I’ve never heard of it before but your article truly inspired to set and keep some of those financing goals I say I’m going to — especially with a system that actualizes my hidden Excel budgets! Thanks Erin! Just read your blog post on Zite! I spend a lot of time each month organizing my spending into “buckets”- it sounds like ‘Simple’ does it for you? Can’t wait to jump in and join. Can you send me an invite?!? Would love an invite if you still have any. I’ve been waiting for this. Daniel, Mandi, and Toby – I’ve sent your invites. Enjoy! Wow. That sounds amazing. I love our bank (it’s locally owned and everyone is friendly and helpful and rates are good, etc. ), but they sure don’t offer all those cool online tools yet.